The Kaweco Special fountain pen is a very nice looking pen with a faceted aluminum body. The slender matte black body reminds me of vintage hard rubber pens. Unfortunately, like the Kaweco Allrounder I reviewed earlier, it’s not really a pen that I would recommend. The first problem I noticed was that the coated brass grip section is tiny; it’s noticeably thiner and shorter than the section you get on a Kaweco Sport. The section is less than half an inch long before you run into the threading and is just over .25″ in diameter. This wouldn’t be the end of the world if it were not a full sized pen. It measures 5.5″ capped, 4.75″ uncapped and a massive 6.75″ posted. Because there is threading on the back of the pen (a feature I do like) the cap screws into the threading resting about .15″ in on the body. With a half full converter the Special weighs 20.5 grams which feels like a lot more when the pen is posted because it is so long. 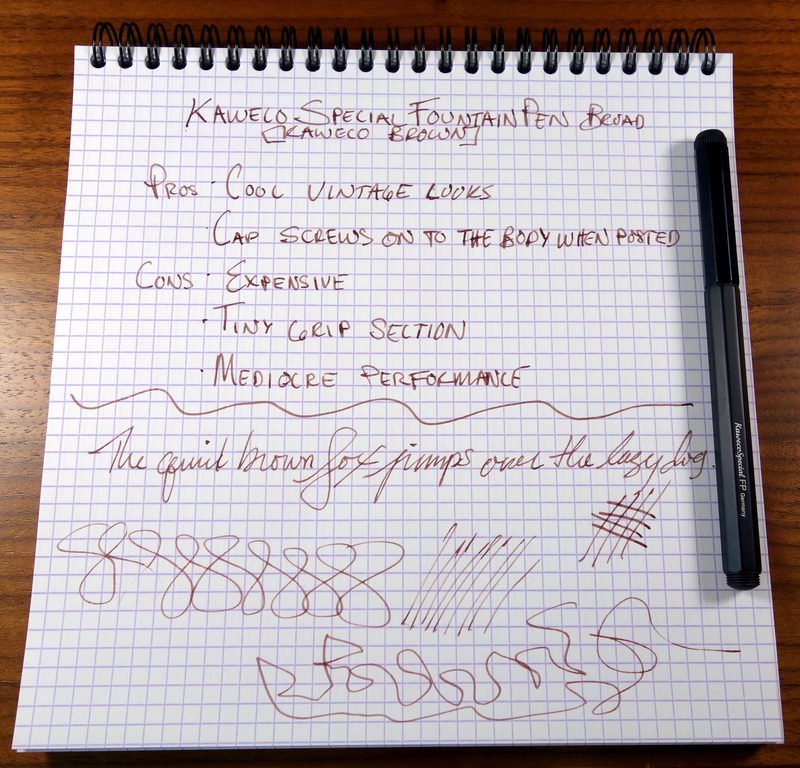 The broad nib is the same as you get on a Kaweco Sport and the performance was pretty difficult in the beginning. There was a lot of skipping. As I used the nib more it became less of an issue but it never totally went away. I again think that the feed had trouble keeping up with the nib as was part of the problem with the double broad AC Carbon I reviewed. It does take a Kaweco converter which is actually quite nice looking as far as converters go…if you notice in the picture the piston is about halfway down…that was because I couldn’t get the sucker to write after being stored nib up on a couple of occasions. Throw a $118 price tag on this pen and it’s a definite no-go for me. If you want to spend $100+ on a Kaweco opt for a vintage Kaweco Sport with a gold nib and a piston filling system. Bottom-line: Calling this pen a “Special” seems pretty generous. The grip section is made out of brass. The nib is made by the company Bock in Heidelberg. Every nib is different. You can never have the exact same result. So it is difficult to get always a excellent performance. 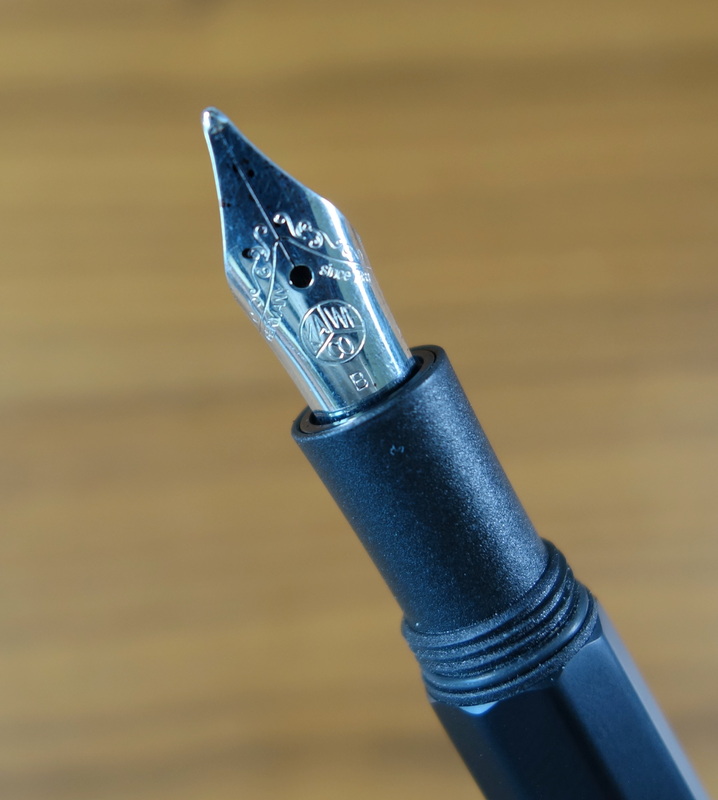 Kaweco exchanges nibs free of cost if the performance is not good. For the special is also a clip available because it is not more a pocket pen because of this long size. The name special is from the vintage model because the design is similar. Very minimalistic. Thank you for your comment Sabastian! Most of the pen is brass but the grip section and end caps on my Special are plastic not brass. I agree with you that every nib is different and because these nibs are mass produced (like many modern nibs) it is easier to get one that doesn’t perform perfectly. Most of the Kaweco’s I have used perform beautifully but the larger B and BB points from Kaweco seem to be more troublesome. I believe the issue is that the feeds have difficulty keeping up with a broad point. My apologies for the error. The section does not feel cold to the touch like the aluminum on the barrel so I believed it was plastic. I will update my post.